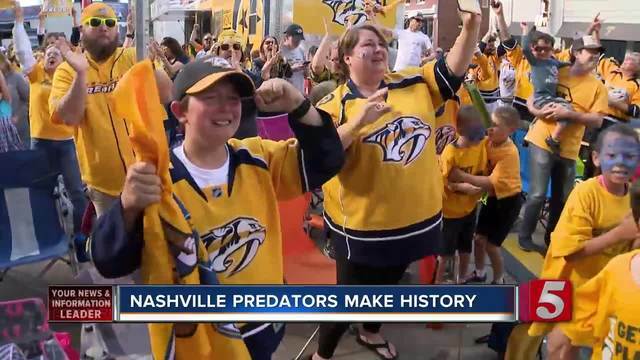 Thousands of fans erupted in praise after the Nashville Predators made history by defeating the Saint Louis Blues in game six . 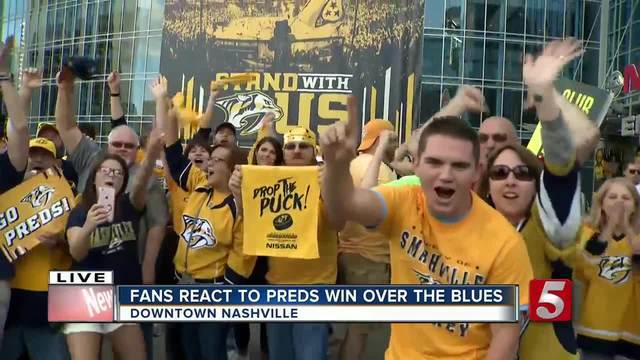 Roaring fans electrified downtown on Sunday as they cheered loudly and waved blue and gold Preds gear. Metro police officers shut down a section of Broadway near 4th Avenue as ecstatic and cheering fans filled the street. "Oh my God! I'm freaking out because this is the best day ever!" one mother with her children told NewsChannel 5. Nerves were visible on many people's faces watching the game at the plaza party outside Bridgestone Arena in the beginning. However, after the Preds scored twice in the third period, the party became mass pandemonium. The high energy swept the area as families and friends went through a roller coaster of emotions. "This is awesome. First time in history, it's awesome!" a little boy tearfully said. Stacy Bubba celebrated her birthday by celebrating the Preds win at Bridgestone Arena. She was already having a good time but the win became the cherry on top of an already exciting birthday. "I'm really excited to be here," Bubba said. "That was awesome and perfect."